We have so many different camera systems available today, that it is getting tougher and tougher to choose between them, especially for those who are just starting out. With mirrorless systems on the rise and advancing at a much faster pace than DSLRs in terms of technology, one might wonder which mirrorless systems are worth a serious consideration. In this article, I want to go over the different mirrorless systems and give my subjective take on each system, stating which ones are the best and the worst, by my order of preference. All of the information presented in the article is based on not only my personal observation and experience, but also the feedback I have been gathering from other sources, including our PL readers. During the past few years, I have been shooting with a variety of different camera systems. While I keep Nikon as my primary DSLR camera system, I have been fortunate to shoot with everything from small point-and-shoot cameras all the way to medium format digital cameras. I have reviewed a number of the cameras I have used, but many I have not had a chance to review yet, or never had any plans to review in the first place – sometimes due to time constraints and other times due to other commitments. To get an idea of the cameras that we have reviewed so far on this site, check out the camera reviews section of this website. In addition to the various reviews, I have been writing about camera gear for a while now and I have been participating in discussions with not only many different industry experts, but also directly with photography professionals, some of whom happen to be long-time PL readers. Hence, my conclusions stated in this article have been shaped up from a number of different sources – not just personal opinion. I have been doing my best to avoid direct communication with manufacturers, since I do not want to be influenced by any particular brand. My goal has always been to keep PL neutral to all brands and systems. None of the PL team members have ever accepted payments from any company to positively review their products and our opinions are solely based on our experiences. Now that we have all that cleared out, let’s talk about things that really do matter. The photography community talks so much about high ISO performance, dynamic range, color rendition, image stabilization, ergonomics and other camera features, that it often seems like those are the most important criteria we should be judging each system on. In reality, there are far more variables involved at play; some of them are obvious and others, not so much. In this article, I would like to expand the discussion beyond just camera specifications – I will add topics such as product support, professional support and lens quality – topics that are often overlooked by many. Sensor size is frequently discussed to death by many, including myself. While sensor size certainly does matter, it is not the biggest factor when it comes to system choice. System size is typically closely proportional to sensor size, so it is commonly accepted that the smaller the sensor, the smaller the overall footprint of a system is (with some exceptions). For example, those who shoot with Nikon’s CX or Micro Four Thirds cameras often choose them for their compactness and versatility – cameras, lenses and accessories are designed to be lightweight and compact, which is why people love using them. At the same time, a lens such as the 24-70mm f/2.8 zoom for a full-frame camera tends to be about the same size and weight, irrespective of the camera mount it is designed for. Sony wants us to believe that their full-frame mirrorless cameras are lighter than their DSLR counterparts, and yet when we look at the second generation A7-series cameras, they are just a tad lighter compared to their full-frame counterparts (for example, the Sony A7 II is 556 grams, whereas the Nikon D750 is 750 grams). Toss in a few batteries at 60 grams to have similar battery life on each and the weight differences become even more negligible. Bob Vishneski already compared the two in his Debunking the Mirrorless Hype article he posted a while ago, where he went into greater detail about why we should not believe that a mirrorless camera always translates to lower weight when compared to a DSLR with the same size sensor. Physics are physics, and while some lens designs definitely work better for short flange distances, other lens designs might require extensions to lenses, as we have seen from some of the recent lens releases for mirrorless cameras. For example, if we compare the size and weight of Sony’s new 24-70mm f/2.8 GM lens, we can see that the lens size measures 136mm in length, while weighing a total of 886 grams. In comparison, Canon’s 24-70mm f/2.8L II USM measures 113mm in length, while being lighter at 805 grams. The same goes for the Nikon 24-70mm f/2.8G that measures 132mm in length, weighing a tad heavier at 900 grams. The Sony’s 70-200mm f/2.8 GM OSS is not smaller or lighter than the Nikon and Canon counterparts either. Less weight for a camera body can also be disadvantageous in terms of handling, as it makes the setup too front-heavy, due to cameras being significantly lighter than the lenses. We can see that lower-end full-frame cameras are definitely more expensive than the mid-range options with smaller sensors and that’s where we can say that the size of the sensor might be at play here. 1″ / CX costs the least amount of money at under $500 MSRP, with Micro Four Thirds being under $700, APS-C ranging from $800 to $1,200 and full-frame starting at $1700. Therefore, it is important to keep in mind that cost is not always directly correlated to sensor size. Unless one looks at lower-end to mid-range options, the cost of owning a higher-end camera from any system can be significant, irrespective of the sensor size. Keep in mind that I did not include other important factors such as size, weight and lens selection. If you have any interest in looking at a bigger picture, especially in terms of lenses, I recommend checking out the Camera System Comparison article and the rest of this article, where everything is analyzed in much greater detail, including overall size and cost of lenses for different camera systems. One of the most important criteria for choosing a camera system is lenses. In fact, when evaluating a camera system, one should always first evaluate availability, quality and reliability of lenses for that particular system and see if such lenses would satisfy their needs. Pretty much every mirrorless system on the market today has a 50mm full-frame equivalent lens to shoot with. But once we look at general specifications such as size, weight, price, maximum aperture and other features such as weather sealing, we will start seeing differences rather quickly. Add other variables such as sharpness, contrast and bokeh performance at large apertures, sample variation, quality control and professional support, and suddenly your options are looking quite different. Therefore, before considering investing in any new system, one should carefully evaluate their lens needs and see if the target system would be able to accommodate them. In the charts presented below, I will be evaluating different lens options for each mirrorless system and providing my ranking, based on my experience with those lenses. Based on what we have seen in the past few years, many newly-announced mirrorless cameras often ship with a slew of software issues and bugs, thanks to all the new technology we see in them. While most software issues and bugs are typically addressed via firmware updates, it is important to look at how quickly such issues are resolved and whether the fixes truly address the problems. I have seen cases where firmware updates don’t do much to fully address all the problems and some firmware updates have been even known to cause other serious problems to cameras, requiring customers to send their cameras to the manufacturer’s service centers for repairs. While such situations are rather rare nowadays, if a company has a track record of issuing bad or unreliable firmware updates, one should definitely take that into consideration. In addition, camera manufacturers rarely go back and add more features to existing cameras, since they want their customers to spend their money on the latest camera model instead. Why would they make their older cameras better and thus potentially take away their current model camera sales, right? Actually, we have seen such behavior from Fuji, which is known for adding new features to existing, sometimes rather old cameras through continuous firmware updates. Such service commitment should not be ignored, as it translates to a lot of long-term value to photographers. It is especially annoying to buy a camera, only to realize that a newer camera mostly has firmware tweaks and upgrades that could have been easily implemented on the older camera body. We have also witnessed manufacturers releasing camera updates too quickly in order to address serious problems, or make their cameras more competitive. Nikon has tarnished its reputation with the Nikon D610, which replaced the faulty D600, whereas it took Sony only eight months to make the Sony A6500, which is what the A6300 should have been in the first place. And Sony never properly addressed the overheating issues with these cameras when recording 4K video, something many regard as unacceptable. Companies like Nikon and Canon are known for their excellent professional support. I have been an Nikon Professional Services (NPS) member for a while now and I know that if anything goes wrong with my Nikon cameras or lenses when working in the field or even traveling, I can fully rely on Nikon providing assistance and loaners while my equipment is getting repaired. This type of service is invaluable for professionals like me, as it gives us peace of mind when working on important projects, especially when working with paying clients. Unfortunately, most mirrorless camera manufacturers today are too new to offer reliable professional support. Some, only recently started their professional services worldwide, and others have only been rumored to announce professional services, with nothing to offer at the moment. It is also important to consider potential costs for professional services. For example, Olympus charges $100 per year for its Pro Advantage professional services and so does Sony for its Sony Imaging PRO, while my NPS membership is completely free year after year. Before we take a look at the big picture, let’s take a look at some of the lens options from each camera system. I will be looking at a number of primes, along with a few higher-end zooms, since photographers usually build their systems based on a range of different lenses. Please note that I decided not to list any of the discontinued / dead mirrorless systems from Samsung and Pentax. The Leica and other medium format mirrorless mounts have also been excluded, since they do not compete directly with any of the mirrorless systems in terms of price. Aside from the 32mm f/1.2 and 70-300mm lenses, Nikon has not released any pro-grade lenses for the Nikon 1 system, so I did not categorize any of the above into professional and enthusiast grade lenses. As you can see, Nikon has not done a very good job with providing lenses for the Nikon 1 line – there are many gaps to fill and pretty much all zoom lenses are slow f/3.5-5.6 variable aperture lenses. Optically, most Nikon 1 lenses are quite good though and they resolve enough details for 1″ Nikon 1 sensors. Sample variation is not something to worry about – most samples I have tested personally were quite solid, with few issues. And price-wise, all Nikon 1 lenses are quite affordable, with 32mm f/1.2 and 70-300mm being the most expensive lenses for the system. We see exactly the same pattern for the Canon EOS M lenses as Nikon 1. Although some of the holes are plugged with third party lenses, those are all manual focus lenses and Canon clearly has not concentrated enough on the EF-M mount to make fast, good quality lenses. All zoom lenses are also slow, variable aperture lenses. On the positive side, the cost of lenses is fairly low and sample variation is pretty good as well. If Canon pushed more high-quality lenses for the M mount, this could be a very promising mirrorless system. As you can see, Micro Four Thirds has a variety of both enthusiast-grade and professional-grade lenses. While I have not had a chance to use all of the lenses in the above table, the pro-grade lenses from both Olympus and Panasonic I have used in the past were optically strong, had superb build and had very little sample variation. In fact, when it comes to build quality and sample variation, the Olympus PRO lenses I have previously tested were very comparable to Zeiss, which is impressive. Pro-grade lenses for Micro Four Thirds are rather expensive, but their quality is often worth the high price tag. The lens line-up is not as complete as Micro Four Thirds, but it is still great to see mostly Fuji lenses in the above table. What’s great about Fuji lenses is their optical performance – most of the lenses, even enthusiast-grade ones, excel on Fuji X lenses and are capable of resolving quite a bit of detail. Fuji engineers definitely deserve all the credit for making such a superb line-up for the X mount. I have also found Fuji lenses to be very reliable, built to high standards and with very little sample variation; I would say as good as Micro Four Thirds lenses. I am not a fan of cheap zoom Fuji X lenses, since those can be iffy in terms of optical quality, build quality and sample variation, but the primes and the higher-end zooms are really excellent. While one could argue that all of the FE lenses listed below would also work for the E mount and hence the tables should be merged, I have several arguments against that. First, the E mount lenses would not properly work on full-frame cameras, since the image circle is not large enough (only a small portion of the image would be available for use, which diminishes the resolution of the image). So merging the two mounts does not make sense from this standpoint. Second, lenses developed specifically for full-frame cameras are larger and more expensive, thus completely losing the size and cost the advantages of the E mount, making them incomparable to lenses for Micro Four Thirds and Fuji X-series cameras. In addition, unnecessarily large and heavy lenses would result in ergonomic issues, making the setup too front-heavy on such lightweight camera bodies such as the Sony A6000/A6300/A6500. For these reasons, I decided to keep two separate tables – one for APS-C E mount lenses and one for full-frame FE mount lenses. Based on my rather extensive experience with the E mount (I have reviewed and tested pretty much every Sony NEX and A-series cameras), I would think twice before investing in Sony E mount lenses, since I saw all kinds of problems with them in the past. Generally, they are not that great optically, but the worst part is their poor build quality and sample variation. Over the years, I have used many copies of lenses such as the 10-18mm f/4 OSS and 24mm f/1.8 and I was very disappointed to find so much variation in optical performance between the different samples. Many demonstrated heavy decentering issues and when testing them in a lab environment, exhibited very inconsistent optical results – not something one should be experiencing from a premium lens. I had to go through a couple of 24mm f/1.8 lenses before I was able to get my hands on a stellar copy. Unlike Fuji, Sony did not start out great in terms of a solid line-up of prime and zoom lenses when it launched the FE mount. Aside from the excellent 55mm f/1.8 ZA, most other lenses were rather disappointing in terms of optical quality and build. The 24-70mm f/4 OSS should have never had the Zeiss name on it, as it was a pretty poor performer even when compared to the cheaper 28-70mm kit lenses. Since the announcement, I tried out a few samples of the 24-70mm f/4 OSS and I could never find a good one – each sample showed heavy distortion and poor overall performance, exhibiting pronounced decentering issues in different corners. I detailed my initial experience in my “best and worst Sony lenses” article with some frustrating facts and I had a chance to retest a couple of more samples, after which I gave up. Let’s get one thing straight – even if a Sony lens has a Zeiss name on it, one should not assume that the lens was designed or made by Zeiss. The Zeiss name is more of an endorsement. Zeiss-labeled Sony lenses are designed by Sony engineers. Once the design is reviewed and approved by Zeiss, Sony simply slaps on that name for marketing reasons. The Zeiss-branded lenses for the Sony E and FE mounts (Touit, Loxia and Batis) are the ones that are designed and manufactured by Zeiss engineers (most Zeiss manufacturing is outsourced to Japan). Sony definitely made a come-back after releasing a few high-quality primes and zooms, especially the “G” master series lenses – those turned out to be on a whole different level in comparison. Much less optical issues, solid performance and build quality and sample variation seems to be better as well. So far I have tested a couple of copies of the 85mm f/1.4 GM and 24-70mm f/2.8 GM lenses and they did not disappoint. The same goes for Zeiss Loxia and Batis lenses – truly superb and well worth the investment. The Sony FE system is definitely looking a lot more promising today, thanks to these lens releases. Let’s now go ahead and compile all the information together and see what we get. Please note that the table presented below has been gathered from a number of different sources. Some of the provided information and analysis is subjective, based on my personal experience with the system. Based on all the information I provided so far, you can see that when it comes to lenses, my preference lies with Micro Four Thirds, Fujifilm X and Sony FE systems. Neither Nikon, nor Canon have developed enough high quality lenses, so they take a hit when it comes to lens selection. Sony E mount takes a hit for sample variation due to the reasons stated earlier in the article, earning it the “least preferred” status lens-wise, while both Micro Four Thirds and Fuji score the highest, thanks to having superb lenses. Since there are so many different criteria for evaluating cameras, it is hard to put all that information in a single table and provide proper weights and scores to each criterion. Here, I mostly based my assessment on image quality, stabilization differences and ease of use, although that’s obviously a very limiting way to assess cameras. The main factor, in my opinion is image quality and that’s obviously where size matters – generally, the larger the sensor, the better the image quality. Stabilization is also getting more and more important nowadays. With camera systems now offering both body and lens-based stabilization, it is making the systems more versatile, especially because such amazing features as pixel shift can be implemented. Therefore, I gave two points to any system that offers both body and lens-based stabilization. Ease of use is also important and that’s where Nikon, Canon and Fuji score the highest, thanks to their excellent menu systems, intuitive dials, controls and buttons. I ranked Sony lower, because the menus are either unnecessarily complex or badly organized. And to hell with those stupid Sony PlayMemories apps! It is ridiculous to think that one needs to spend more money on apps that deliver extra functionality to cameras. And anyone who dealt with them in the past knows how unstable and poorly implemented they are. The first three columns give a good indication of how complete a system is. Micro Four Thirds and Fujifilm offer a number of different camera levels – from inexpensive entry-level, to high-end professional-level cameras. Nikon started out quite good with its V1 and V2 series cameras, but after it moved EVF as an optional accessory and switched to MicroSD, I think we can qualify the V-series at best as “enthusiast” cameras for Nikon 1. And while many will disagree with me, I cannot categorize Sony’s A7-series cameras as “professional” – I don’t think a camera with a single memory card slot could ever qualify to be a professional camera. Still, I did not include this data as part of the ranking. In terms of autofocus performance, most high-end mirrorless cameras today do really good there, with some being slightly better or worse in particular situations. Once again, please note that I did not include many other camera features in the above table, such as resolution, dynamic range, EVF / LCD quality / refresh rate, battery life, dynamic range, video recording, and many other features that are also quite important. Therefore, please look at the above table for information purposes only, not as a way to rank a particular camera system. Most of the mirrorless systems have already matured, so their stability and reliability are quite good nowadays. When it comes to firmware updates though, we can clearly see the ones that stand out – Fuji and Micro Four Thirds. I ranked Fuji the highest, because it is the only company that goes back and adds more features to its older cameras. Until recently, neither Panasonic nor Olympus provided feature upgrades via firmware, but with the announcement of the OM-D E-M1 II, Olympus is now saying that they will be adding more features via firmware updates, which is encouraging to hear. I am not sure if that alone deserves a +1 for firmware updates for all of Micro Four Thirds, but it is still better compared to others who just don’t seem to care. In terms of Professional Support, Micro Four Thirds and Sony FE are the only two systems that you can get pro support for, although both require annual payment. Sensor size-wise, I started at 2 for Nikon 1 for its small CX sensor and gave a 5 to full-frame, which basically matches the previous table’s Image Quality column. In terms of system size, Nikon 1 and Micro Four Thirds scored the highest, since the footprint of these systems is indeed very small when compared to APS-C and especially full-frame cameras. The System Cost column takes into account the best cameras and lenses for a particular system, so Nikon 1, Canon EF-M and Sony E are going to cost the least, whereas the cost of Micro Four Thirds, Fujifilm and Sony FE systems can get quite costly. Lastly, if we take into account the lens scores and combine them with the system scores, we get the overall “System Score”, which is the bold number in the last column. The previous number is the sum of all columns, minus system cost. Putting it all together, you can see that the systems I personally prefer over others are Micro Four Thirds and Fujifilm X. In my opinion, these two systems are currently the most complete out of all mirrorless systems in terms of lens and camera selection and they have earned very high praises for their compact size, overall performance and reliability. Unfortunately, neither Nikon, nor Canon have taken mirrorless seriously and it really shows: Nikon has not had a single announcement for its Nikon 1 line for over a year now, making its future questionable, while Canon seems to have only experimented with the M. Neither have done anything serious to make compelling lens choices for serious enthusiasts and professionals. The same goes for Sony, which has been sadly neglecting its E mount, mostly concentrating on releasing FE lenses nowadays. Understandable, but not good for someone who wants to stay compact with an APS-C system. The Sony FE system offers the best image quality when compared to everything else, but until recently, lenses have been lacking in terms of selection, sample variation and quality. Sony FE is also the largest in terms of system size and the most expensive, especially if you buy “G-Master” or Zeiss lenses. I would love to see Sony make full-frame cameras specifically targeted at professionals, with larger batteries, improved ergonomics, dual memory card slots, better reliability, no overheating issues, improved menu system and highly desirable features such as pixel shift. 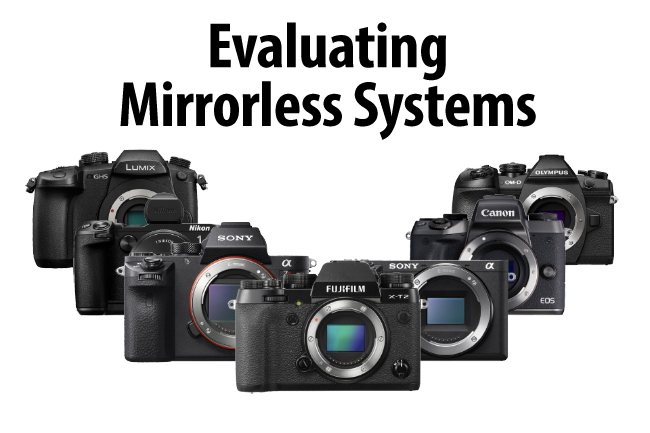 If you are evaluating different mirrorless systems, I hope you will find the above information useful. If you have any feedback or comments, please feel free to share in the comments section below. JJ, I am sure we will be seeing plenty of great FF cameras in the future. For now, I am also very content with my Nikon D750 and D810 camera bodies – they are my workhorses. Looking forward to seeing what Nikon will reveal later this year during its anniversary! Thank you Nasim for this detailed article. I am going to start reading after posting this. I have a Nikon D80 and a Sony RX100 III. I am thinking of spending about £1500 to get better photos – is it worth getting a good lens for my Nikon D80 or go for another camera together with a course on photography. Hopefully your article would help me to make that decision. Anpu, the links you’ve posted were broken, so I took them out from your comment (1drv.ms appears to be down or inaccessible). As for a newer camera or lenses, it all depends on what you are trying to do. If you are maxing out with your camera (high ISO performance, autofocus, etc), you might want to upgrade your camera body – for £1,500 you can get an excellent camera nowadays. If you don’t see issues with your camera, I would invest in lenses instead – they are the tools that make a huge difference in your photographs. Good glass > cameras = always. Thank you Nasim and sorry about the links. Nasim tell us more about the product you are selling via the shop link. I knew you had a D80 and watched your yourtube videos! nifty fifty – is it 50mm lens? Please Nasim and others help me to decide on the camera and lens (spending limit £1500 set by my wife.). What will I do with the camera – take photos of my grandchildren, their birthday parties, take photos of sunrise in the beach where I go for walk and travel photos. The links are from onedrive. Onedrive says they are shareable and works when I send them via WhatsApp. I think I don’t agree with “3” for image quality of 4/3. I have used all sensors except from 24MP Fuji, and based on “my” experience m4/3 sensors (especially the last EM1 II) is on par with APSC. If you are thinking about performance above ISO3200, I don’t use that high ISO and not many people do. In fact, if you add incredible 40 and 50MP modes which can compete eveh top FF sensors, I think image quality should be 4. And thanks for the detailed article. I know how long it takes to write such long text so I appreciate it a lot. Ertan, thank you for your feedback! I agree, 3 is a bit harsh on the 1-5 scale for Micro Four Thirds, given how good they are compared to 1″ sensors and how well they do when put against APS-C. Initially, I had it at 3.5, but I did not want to introduce tenths in the graphs, so I left it at 3, since it cannot be the same as APS-C. While you think that IQ should be at 4, I slightly disagree – Micro Four Thirds is a smaller sensor than APS-C, so its performance is always going to be inferior. Perhaps a better way to present the data would be to rank Nikon 1 at 3 and rank Micro Four Thirds at 3.5, as it sits right in between 1″ and APS-C sensors in terms of sensor size and performance. Still, it does not change the fact that Micro Four Thirds sits on the top of the mirrorless game – it is an amazing system overall! IMO you have this right. I shoot Nikon (APC only) and Olympus and the image quality from the Nikons is higher. They are much better at high ISOs (especially the D500) handle DOF better, and at least in terms of the Olympus OMD-M1 and OMD-M5 mk II, better DR.
Everything is about compromises. You trade lighter weight and great lens stabilization for image quality. That was a lot of work. Thank you for this extensive and informative article! Thank you for your feedback Petra! It did take quite a bit of time to put everything together, but I am glad that it was worth it – looks like many have enjoyed this article and presented information. I think you forgot one very important lens for Nikon 1 (CX) and that is the 70-300 mm (189-810 mm equivalent). It is a very unique lens for the CX-system with a reach that I don’t think you’ll find in the other systems with sensors below FF, and for FF the price is so high for an 800 mm lens (around 15 times more than the 70-300mm) that it is just not within the reach of most people. Personally I would rate it “professional” with a build quality that is on the same level as the 32 mm f/1.2 and with top notch output. Really a great lens for bird photograpy, sports etc. Anders, you are right, I did exclude super telephotos initially. However, after your and Tom’s comments, I decided to add a couple of more rows of data for super telephoto lenses, so the 70-300mm is there now. The 70-300mm is an excellent lens for Nikon 1 and it definitely deserves a spot in the above tables. Thanks for the update. I wasn’t aware that m4/3 had a 400 mm lens equivalent to 800 mm on FF. Excellent work Nasim and such incredible detail! Reading this confirms my path to stick with my huge Nikon investment despite the gap of top range bodies such as the D5 and D810A regarding lack of Bluetooth and GPS capabilities. I obtain excellent NPS support and new lenses are becoming lighter also because ISO performance is improving on the cameras. Thank you so much! Christian, many underestimate the value of Nikon’s NPS and Canon’s CPS – they are truly superb for a working professional. It is also worth noting that NPS and CPS members can get free gear rentals, something that other companies charge quite a bit for, so the benefits are huge. I hope others start doing the same soon, since that’s a pretty big deal IMHO. Hoping to see some marvels later this year from Nikon – the 100th year anniversary is huge! I may have missed it in the preface, but you seem to be omitting the longer telephoto primes and zooms that are available for some of the systems, which provide the “reach” / cost and weight ratios that make the mirrorless system appealing to many. I’m thinking of the MFT system in particular with m Zuiko 40-150mm f/2.8Pro and 300mm f/4 Pro, and the Panasonic-Leica 100-400. Also the amazing 70-300mm for the Nikon 1 system. Thanks for very excellent review of mirrorless camera’s and their lens, I have been contemplating buying a mirrorless system and your article makes it easier to decide which way to go. The lens charts are especially helpful since to me they are more important than the bodies which seems to change almost yearly. My reluctance to switch from Nikon to another system like Fujifilm X is due to the expense of the lens. Excellent article as always with lots of good technical information for people considering a mirrorless camera! You did overlook a very important Nikon 1 lens, the CX 70-300 f/4.5-5.6. This is an outstanding lens that provides excellent performance with an efov of 189-810mm when compared to full frame. It is a great lens for birding and wildlife, especially when used in good light. All of the images in my recent Photography Life article “Photographing Birds Using Slower Shutter Speeds” were all captured hand-held with this lens. Some at shutter speeds as slow as 1/13th. Another important lens for folks who use their cameras for video is the 1 Nikon 10-100 PD zoom. This lens is one that I use with virtually every client video project I do as its power zoom is very smooth. Another important factor is the depth-of-field that can be achieved at more open apertures when using wider angle lenses like the 10mm and 18.5mm designed for 1″ sensor Nikon 1 bodies. When shooting client videos with my D800 and FX lenses I regularly had to move around and set up 2 or 3 studio lights when shooting scenes in industrial settings as I needed to shoot at f/8 to get sufficient depth-of-field when using full frame gear. I’m at least 30% more efficient with my Nikon 1 gear as I can shoot at f/2.8 with the 10mm or 18.5mm and still get the depth-of-field required without needing to set up studio lights. This is a huge advantage for the work I do. There is virtually no difference in noise when shooting video with a V2 compared to a D800 at ISO-800. Your article tends to be a bit ‘prime lens’ focused. For people who prefer shooting with zoom lenses the selection available with the Nikon 1 system provides great focal length coverage. During my recent photography tours to Utah and New Zealand I only took three Nikon 1 lenses with me: 6.7-13mm f/3.5-5.6, 10-100mm f/4-5.6 non-PD, and the CX 70-300 f/4.5-5.6 which created a very small, lightweight, and capable shooting system that provided an efov range of 18-810mm. The Nikon 1 system could certainly use a dedicated macro lens, but most people using the system can get good results using extension tubes and the Nikon 1 30-110mm f/3.8-5.6 lens for close-up photography. There are lots of examples of this type of photography in my articles here at Photography Life, and on my photography blog. Another consideration is AF-C frame rate. The Nikon 1 V3 can be shot at 20fps using AF-C with subject tracking which is wonderful when photographing birds in flight or sports in good lighting. Additionally it can shoot in full resolution at 30fps or 60fps with the first frame locking focus. This is a great feature to use when photographing birds taking off or landing as very precise wing positions can be captured. Of course every camera system comes with its pluses and minuses and the Nikon 1 system does have some short comings when it comes to low light performance. Like all cameras some work with noise reduction can help but for people specifically looking for good low light performance the Nikon 1 system would not be the best choice. Tom, you are absolutely right – I did omit the 70-300mm, which is an important lens for the Nikon 1 system. After seeing your and other reader comments, I decided to update the tables and add two more rows of information to make the tables more complete. As for 10-100mm, I initially wanted to put that in the 70-200mm row, but decided against it, since it is bulkier, more expensive and is aimed at videographers compared to the 30-110mm. It is a good lens for video though and I agree with you there. And I did not include any data for video in the above article either. If I did, Micro Four Thirds and Fuji would still take the top spots, since they have amazing 4K video recording capabilities. With Nikon 1, one has to shoot in burst mode to get to 4K (convert stills to video), whereas M43 and Fuji have that feature natively. I hope Nikon makes a professional-grade V4 with native 4K video recording and insane slow motion fps – I would love such a camera! Great read Nasim, thank you. I recently caved and bought a Fuji XT-2 & 23mm f/1.4 prime and, so far, have been blown away – sure it is not perfect (no camera is) but, what it occasionally lacks in features or usability (which is not much), it more than makes up by being part of a well designed and fast growing system. It is also beautiful to look at (graphite silver) and a joy to use. What concerns me as a Nikon owner is how much more engaged Fujifilm are with their customer base and how keenly they are developing both new and existing products. My D500 is taking a rest now and, frankly, I am not sure it’s going to see much use whilst I have so much quality, variance and enthusiasm available from Fuji in a package that feels half the size. After all, where is the Nikon DX lens roadmap? Well done Fuji. Wake-up Nikon. Relating sensor size to image quality is basically correct but the more important question is what is the user’s intent and need? That will determine whether the image quality of a given sensor is sufficient. In my judgment mirco four thirds image quality is as good as what we ever got out of 35mm film. A single autofocus score is not helpful. There should be two scores, one for single autofocus and another continuous tracking autofocus. It is in continuous autofocus where we begin to see a great deal of difference. For some types of photography this is the most important issue in considering a system. For others it does not matter at all. You seem to equate Olympus menus as all micro four thirds menus. Panasonic has some of the best and easiest menus of any camera system. Brandon, I fully agree with you – intents and needs are important when considering any camera system, as I have stated in the beginning of the article. If one wants wall-size prints, a full-frame or medium format system will be unrivaled. For everything else, a smaller system could be just as good! Micro Four Thirds is amazing, without a doubt – most people would be more than happy with the image quality they get from a smaller system when compared to full-frame. We are just constantly told that bigger is better, which is only partially true! As a result, most think that they should be investing in full-frame systems, when in reality – it is overkill for them both in terms of size and cost. As for AF, I agree, a single score might not be sufficient – AF accuracy, speed, reliability and tracking are all very important. However, I did not want to make the camera table unnecessarily complex, so I kept it simple. There are definitely differences in AF tracking between mirrorless camera systems, but the gaps are closing pretty rapidly and they are all getting really really good. Perhaps not on par with DSLRs for fast action photography, but already pretty darn close, if not better, for everything else. Lastly, I agree with you on the menus – I did grade Panasonic unfairly compared to Olympus, so I went ahead and updated the chart to bring M43 to 5. Olympus might have a complex menu system, but at least it makes sense. Sony’s menu is the worst by far, with things scattered all over the place. Excellent work down to details. I would like to share my experience. I was a Canon for over 10 years and I had a pretty nice lens colection, like 10-22, 100 mm macro-f2.8, 17-55 f2.8, 70-200 f4 and bunch of old manual lenses that just leave you breathless…. About 2 years ago I decide to take the chance and got in to Sony A 6000, after one year moved to Sony A6300. Now I have the 12 mm-f2, Samyang, 16-70 f4 zeiss, canon 70-200 f4 and 50-f1.4 konica hexanon mmanual lens. For travel I’m taking only the 16-70 zeiss. I’m telling that the difference is very significant, my old travel bag is to big…., my back out of pain and all around compact convenience makes it easy to have the camera with you all over your vacation. I will never ever go back to Canon. To be honest, I miss so many good futures form Canon, but for me the Sony covers my needs very well for travel and hobby photography. Was not easy to learn all the rings and bells of complicated Sony system, but now I’m confident with the settings. Thanks for a great article which helped clear up some questions I’ve had. Photography Life gets better all the time. Thank you Allen for your feedback, I really appreciate it! thanks for the interesting post. My first Nikon was an F2A and was a Nikon user ever since, except now,… you wrote an article about the Olympus E M5 several years back, so after reading that about a year ago, I bought a used one and now as much as I think Nikon produces superior images, I find that when I head out to make some images I have an Olympus in my hands. Maybe its my age, or something. Thank you for sharing your story and for your feedback! A lot of time/work away from your camera to write this my hat is off very excellent!!! Many of us are on that limited income to start and will dive in with the $500 or less. I started/decided on the Canon T2i (@$800) in 2010 and in 2011 got hooked on HDR and thought I needed more frames than two @ +/- 2ev and by 2012 Canon stopped support of firmware as it made the T3i etc.. I had a Canon Ftb/AE1 and lenses from the ’70’s so in 2014 Sony’s release of the Full Frame A7r/s I did your same study sorta. Yes hardly no lenses but I had a bag full collecting dust that could be used with adapters BUT at $2K+ I had to think this will be my last and that was equal to two cameras and the A7s would do 5 frames @ +/- 3ev (sunrise/set and moon with foreground) (I never thought about 12.2MP[I have cropped to 200% and printed a poster size no problems]). So all my Canon lenses FD/ EF-S would work and did/do real well and not collecting dust. I now have 10mm (Voigtlander) to 600mm (up to 1800mm [aps-c] (Sigma) I LOVE my secret SEL1018 (12-18 Full Frame or 15-27 APS-C) f/4 for Milky Way Shots (something I discovered my accident). And with the SEL1635Z/SEL24240 also in my main bag I am all set. It took time and pennies to get where I am today but Sony still supports everything and the value has not gone down (yet). I still use my Canon’s Ftb/AE1/T2i and all my lenses all in different bags and do not collect dust. I also think the drive for Fast Glass is for those who can not get above ISO 6400 without noise problems. And once Fujifilm/PhaseOne mid frame cameras get wide lenses (=12 to 14 f/2.8) you will see more at night doing night landscapes/Milky Way shots because of bigger pixels. As far as the Sony menu and in camera apps you have to think/remember more that is all. PS/Lr and CaptureOne can not keep up with lens corrections so the in camera lens correction app is a god send doing both raw/jpg (try and correct the Rokinon 14mm f/2.8 horizon without PS when it first came out). I shoot raw and jpeg why?, only a few camera settings effect raw but I paid for all those extra settings and like to play with them also. Also camera control by phone or pad (I don’t much). And getting CaptureOne Pro processing software for $50 (vs $300) and no need for renting PS/Lr every year. I went out on a limb big time with my pennies/nickles/dimes if I had not seen Trey Ratcliff’s (first a Nikon guy) move to Sony and reviews and his low cost view on photography I do not know where I would be. I do thank also Photography Life for it’s support for Sony with the Sensor cleaning stick (I like to shoot at f/16 to f/20 for detail not dirt) and great Sony info support. And finally you hit a point on the nose most if not all sensors come from Sony so when the new A7s mark 3 comes out who will need a f/1.4 lens (except that blur). One more camera A7r2 the end also a photographer not a video guy!!!! Thank you for sharing your experience Edwin, I really appreciate it! Sony has a wonderful system now and after a few tweaks, it is getting much better now – definitely a whole level better than the first generation cameras. Sony is also doing a good job with lenses – so many great lens releases in the past year! Nice review but it bothers me that you lump MFT as opposed to breaking it out as you did every other brand. Why not lump Canon & Nikon offerings together? Of course it doesn’t make sense. At least splitting out Olympus and Panasonic would have made sense. Someone already pointed out the issue with menus and I think there are other differences as well. Just my 2 cents. Jim, I initially had it broken down by Olympus and Panasonic. However, I think the biggest advantage of the Micro Four Thirds system is the fact that you can use lenses and accessories interchangeably – that’s a huge advantage, which puts M43 in the lead. If they did not share the same mount, I would have definitely kept them separate. As for my comments on the menus, I have already addressed them – please see my comments above. As for other differences, I don’t think there are that many between the two – both Panasonic and Olympus offer amazing camera bodies that address pretty much any need. A great system for sure! When you make hd video with a full frame dslr, each frame is 2megapixels. So does the 24mp camera use its entire sensor for each frame? Or just a small part of it? If it uses only a small part, why do people use full frame dslrs for a shallow DOF? Muhammad, it all depends on the implementation of video. Not all cameras record video the same way – some read the whole sensor and oversample, while others crop. For the cameras that crop, there is no advantage when comparing to smaller camera systems, since you don’t have better handling of noise. Very informative article, Nasim – hats off for packing so much information in a bite-sized package! Greg, it is normal to see lens corrections being automatically applied in software like Lightroom nowadays – Fuji is not the only one who does it. You will find corrections applied to many Micro Four Thirds and Sony lenses automatically as well. Given the challenges of making more compact lenses, manufacturers are now relying on those corrections to make lenses that were considered “unacceptable” in the past – and that’s a great thing in my opinion. The good news is, you can use other software to convert RAW images and still see all the distortion and CA characteristics of a lens. That’s one of the reasons why I no longer use Lightroom to convert RAW files for measuring Imatest data – I now convert everything with DCRaw, which does not read any of the corrections. Might not be the best way to represent lens performance, but it gives a pretty good glimpse at the actual design pitfalls of a lens. Oh, I don’t doubt for a second that it can be useful to rely on digital corrections to keep size and weight down. However, would you not need to measure sharpness-across-the-frame for both the uncorrected AND the corrected files then? If there is a barrel distortion of 3.5% like for the Fujinon 2/35, surely this will affect sharpness of the most corrected areas, no? You did leave out the Nikon 1 70-300mm f/4.5-5.6 lens, as noted also by Thomas above. This lens is significant, in my view. It has very good optical characteristics AND can be operated up to 20fps, which is significant (apart from the reach allowed by the crop factor). Each mirrorless system has its shortcomings but, to me, one of their attractive features is that, for those with sensors smaller than APS-C size, the optics reduces tremendously in weight and size. With the possible exception of astrophotography, I would NOT currently even consider a full frame mirrorless. What’d be the purpose of carrying all that gear? We’d be back to square one, so to speak, when you travel and/or lugging stuff around becomes not feasible. A lot of gear!!! The A7s full frame with just the so small SEL1018 f/4 AF/IS (12mm [42 second shot] to 18mm Full Frame mode) or Voigtlander 10mm f/5.6 (50 second shot) both very little coma if any and staying at ISO1600. I have captured from sunset to sunrise on an Island and it’s beaches on one battery with only a tripod and camera and a photographers vest full of water and snacks getting every shot usable. I have even captured the Milky Way full of color in a park lit with amber sodium vapor lights that is how good it’s AWB is for a whole scene. Hey I could not believe it myself in Aperture mode and a 10 second shot. Antonio, please see the updated article and the comments above – I went ahead and added the 70-300mm to the tables. Thank you Patricia for your feedback! Olympus makes amazing cameras, but their menu system is way too cluttered for sure. If you want something as simple as your Canon, I would recommend to give Fuji a try – you will find those cameras very easy and intuitive to use! Dials and rings for everything, so you can shoot everything like on the older film cameras. I personally think Fuji currently has the best menu system out of all mirrorless offerings. Nikon 1 is super easy to use as well, if you don’t mind the smaller sensor. Each manufacturer take their DSLR, get rid of the mirror (in other words, put their mirror-less guts inside) but keep the lens interface. The result should be a slightly smaller and much lighter camera (even if they have to increase the battery size to make up for mirror-less power hunger), and we, the consumers, get to keep our lenses. I’d buy that immediately. So, why don’t they do that? I should have prefaced that I like the DSLR size and ergonomics. The mirrorless body shape is just too weird. However, DSLRs tend to be too heavy. And the mirror is the bottle neck for fps (11/12 fps max, seriously? Any mirror-less can do 20 fps easily). So, get rid of the mirror, all the mechanics, and the penta-prism. That should eliminate a lot of weight even if more electronics need to go in. The key is to allow us to keep the same lenses. Most of us has too much invested in lenses to switch. I have a question regarding wildlife and especially bird photography. Would you recommend any mirrorless system (camera + lens) for this type of photography? Or do you think it’s still better to stick with DSLR? Thank you again for a very interesting comparison of the current camera systems. Sinisa, for now, I would stick with a DSLR. Mirrorless is getting really good with AF, but there are still issues to deal with – EVF refresh rates, blackouts and continues tracking issues. It is not perfect, but it is getting there. I think in a couple of years, we will start seeing mirrorless systems that will be better than DSLRs for tracking subjects and nailing AF. I think the wildlife/sport photo equipment, as it stands, is quite good. I have a Nikon FF with new 300 mm F/4 and 20-700 F/2.8 with a couple of TC. I don’t need better ergonomics or performance. Been looking for a large sensor mirrorless camera for travel. I think Sony A6000 series is the smallest, but I agree the lens choices are not large and menu is not great. Olympus Pen F with a smaller 4/3 sensor is larger in size and costly. Nikon CX only works in good light. Fujifilm looks good on paper, but seems a bit pricey. I want a Nikon FM in a digital mirrorless format with excellent EVF, either FF or APS. I would throw out the cost and weight of a back LCD display and internal flash. Keep it light, durable and simple. A couple of prime lens and it would be just perfect. Joe, I fully agree with you – for sports and wildlife, mirrorless cannot compete with DSLRs. Try shooting fast birds in flight with a mirrorless camera – it is a challenge for sure! As for a good travel camera, check out the new Fuji X-T20 – that’s a lot of punch on a small and relatively inexpensive camera body. Wait for the holidays to get the usual $200-300 discounts on lenses. That’s how I built up my Fuji system. It is amazing! I keep referring to your own PL post from last May with the Fuji lens discounts. I hope they do it again this May! It’s too bad you departed from hard facts for an arbitrary kind of ranking the systems on various characteristics. Mirrorless definitely seem to have cost savings for manufacturers by lessening moving parts, and higher profit margins. I have seen incentives offered to sales staff for them. This might seem quite low in percentage terms, but the big two were offering none. In real shops you can visit, new camera bodies are usually sold at barely more than cost price. The smaller mirrorless manufacturers have more expensive enthusiast lenses than the big two when you compare them on what they do which is where the real profits are. As someone who has had to sell these things, I find them trying hard to appeal to people on the grounds of looks and dials. People who’ve been in photography a while admire all the dials on Fuji and Olympus and the diddy size in a remarkable way, really, when you think they would know better and judge a camera on the output instead. Panasonic is something different- though I don’t rate them for stills with the small sensor, they sell on the strength of their video and comfort for holding for extended periods. Where I was, people did not really respect Sony for various incongruities in their design. Sony want to think they have ‘pro’ cameras in their line, but they don’t seem to be designed by photographers and their stable has a confused look. Battery life is poor, the bodies and system have practical issues and the repair costs are the highest of anybody. I believe the pro of a smaller sensor is that you can build really long zooms more economically. For instance, Olympus used to make a fast aperture 50-200 that was almost half the size and price of a Canon 100-400 yet due to equivalence had the same functional field of view. At the other end trying to make wide and fast lenses, the smaller systems don’t have a cost advantage; looking at their prices they have a disadvantage. And the tonality of images with the small sensors suffers unfortunately. It is beyond doubt to me that the big two deliberately drag their feet on mirrorless with their offerings. They do not want to grow this market with all these extra competitors. At the moment I would have no trouble recommending something like the D5300 DX with an 18-55 VR to any shopper in the market for an interchangeable lens camera, as a safe and economical choice. Thanks for a very well done article. Lot’s of research and time involved . I have several Nikon DSLR’s that I hardly ever use. For me, I find my Olympus Stylus 1s is hard to beat. Nice and small. Mirrorless, and no lenses to change. For me the image quality is good enough. For those that need great image quality, your article will be very helpful. Thanks for doing the research and posting such as great artcle. Katta rahmat, Nasim! Excellent review! I’ve been a long time Micro 4/3 user and can attest to the fact that it offers one of the best size to image quality combinations. Thank you for your feedback Alex! Micro Four Thirds is great, without a doubt – check out Alpha Whiskey’s posts at PL. He is a great M43 photographer! I have an Olympus micro 4/3 system that is wonderful and easy to transport. So, why did I buy a Nikon D750? High ASA ratings with great dynamic range of the sensor and a few controls not available with 4/3 systems. So now I don’t have to carry many batteries, a separate flash with more batteries and I find that a simple bean bag or the like helps with steadying the D750. Not to mention a sling camera strap which makes it all possible as the supplied straps are well… painful. Most of my photography is done while traveling and most of the traveling involves cities or some landscape while crossing the country. If I need a long telephoto lens, the answer is 4/3. If I need the earlier mentioned advantages of a FF camera, the 4/3 system won’t cut it. Your article was really done well as it takes a good understanding of which audience the camera manufacturers are trying to reach. Keeping it all within an easy understandable presentation makes it a gem. Lewsh, that’s a great point – some mirrorless cameras can be great as a second body, to take on those travels and hikes when you do not want to lug a full-frame DSLR with you. My primary system is Nikon, but I also own a Fuji mirrorless system, which I prefer to take when traveling light. Since i am a D40 shooter and keen to upgrade this november (hoping for good prices) i am drawn to the D750 and presently confused due to this article. I immediately jumped to the lens review section and found only two lenses for FujiX mount. I hope you start posting more reviews of say at least native fuji lenses to begin with so that we are lucky enough to take your word and then make decisions. I just was targeting 24mm and 85mm prime along with the body. Will patiently wait for you to make up my mind in the coming months if the FujiX is what i actually need. Sai, I have not had a chance to post many Fuji lens reviews yet – hopefully that will change later this year! Long Time Nikon user untill my D750 DIES from various failure. I bought GX85 and leica 15mm. @ the beach or night the D750 sweep the floor with the GX85. as with strong sun hard to shoot and compose. but its two different tools for different jobs. I need the next gen DSLR along my GX85. Nasim, thanks for the awesome overview. Will you try to keep it up-to-date as new lenses are released? Regarding Fuji: You probably wanted to write XF60 instead of XF56 as the entry 85-equivalent? Because in the equivalence-column you wrote 90. The 50 f2 which is about to hit the streets is probably what really belongs in there imho. You also forgot the 55-200 as an entry telephoto zoom. Thank you Jano! I wrote the Fuji part before the 50mm was announced, so I forgot to incorporate it – thanks for letting me know. I updated the chart with your suggestions, so thank you for your feedback once again! Erol, I personally would not shoot a subject if they were that far off in the corners of the frame. In situations where I need to do it, the focus and recompose method works just fine most of the time. Hope this helps. Why didn’t you include Leica SL here? It is also amazing mirrorless camera I guess. Because it has 3 lenses, costs more than MF, and it’s niche beyond niche. I don’t think it’s worthy of consideration with the actual systems. Because it would not belong – it is a very expensive system designed for a very small niche. Thank you very much for this evaluation. I think choosing a DSLR is something very personal. I read a lot of opinions in the press and on sites like yours that are relevant to my eyes. This helps me a lot because I do not have much time to try all these wonderful new gadgets. I recently chose to buy the Nikon D500 with the lenses 16-80 VRet 300 VR PF instead of the Olympus EM 1 mark II with the 12-40 and 300 F4. What convinced me is the general ergonomics and especially the reactivity and accuracy of the autofocus system. Even if I know I can not make such beautiful pictures on your blog, it inspires me a lot. And the fact of having equipment where all the essential functions remain easily accessible, it gives me much more confidence. Actually, I like the photo first for the relationship I have with my subjects. The equipment should not be an obstacle between my subject and me. It’s just a technological mediation and nothing more. I like Fuji very much for their image philosophy and Panasonic for their video science, but I appreciate above all the spirit and know-how that inhabit the Nikon engineers to design a tool like the D500 so compact , So simple, so powerful:it helps me to create. Manuel, thank you for sharing your experience! The D500 is a great camera without a doubt – if I were shooting sports and wildlife, I would pick that over any mirrorless camera. Mirrorless is getting better, but it is still not there in terms of AF speed, AF accuracy, EVF refresh rates, blackouts, etc. when compared to a DSLR. Do you compare Fuji X-T2 with D500 and Fuji X-T2 to D7200. Could you explain to me the comparison criteria, you do it on what grounds? Those are DSLRs. Nasim did enormous work with just the mirrorless systems. Vladimir, I provided the D500 and the D7200 in the article as a comparison of cost. In terms of features and speed, both have their pros and cons when compared to the X-T2. Best mirrorless article I’ve read! The issue for me isn’t which mirrorless to buy but whether to upgrade my beloved beginner Nikon to say a 7200 or buy a mirrorless. I have a lot of Nikon lenses and I hate to buy them all again. I think my limit for body and lens is $2000. Last week I found out that my Nikon doesn’t bounce well so it’s time to buy something. Any suggestions? Dianne, if you already have a stable of Nikkor glass, why reinvest in a new system? It would be very costly… If you don’t mind that, then my recommendation would be to try out the Fuji X-T20 with a couple of primes – it is one heck of a camera for its price. If your $2K budget is only for the camera, try out the X-T2 – it is an amazing camera. And lastly, if you want to stay in the Nikon camp, the $2K budget is great to move up to the Nikon D750, which is an amazing camera! Any time I take either D750 or D810 into my hands, I just want Fuji instead. If I take Fuji (even X-T2) and I shoot with it, then I open my files, I feel I’m missing something, especially landscape images. They look kind of flat to me compared to D750, and especially D810 output. EVF vs OVF…each one has advantages and disadvantages. I just don’t like shooting with EVF outside, sports action (basketball particularly), or any other fast moving object. I find that my landscape composition with OVF is more accurate, and I barley crop, if any. Very last one, I spent a day with X-T2 and XF50-140mm (100-400mm would be even worse), all I can say, it’s not that comfortable without additional grip. If I would add the grip, why wouldn’t I go for camera like D750 in first place. There’s more to it, but I picked my major points, which make me to owe “good old mirror based camera”. Mirrorless is the future, I have no problem to understand that, but DSLR will still live long life, most likely with limited number of users. George, thank you for sharing your experience! I personally don’t like the size and the weight of the 50-140mm either, as it is a bit too big for the X-T2. Small primes and the 10-24mm is what I personally love and shoot with. For landscapes, a full-frame camera is always going to yield better images due to larger sensor. I personally love the X-T2 for landscapes, but if I were to shoot for large prints, full-frame or larger would be my preference. Let’s compare D750 and X-T2, the same resolution. Is it just me, or there is more depth, more 3D, more richness in files coming from Nikon, hard to explain in words. It’s not about size of prints any more, the resolution is the same, at least how I get it. George, it all depends on how you post-process your images. Color and the richness you are describing is subjective and it can be imitated using post-processing. The “3D” effect you are describing is not something that comes from your sensor – it is an attribute of a lens. However, larger sensors do yield better overall image quality – better noise, sometimes even better dynamic range. Nikon files are generally easier to work with compared to X-trans, since not every RAW processor is properly optimized to work with X-trans yet. Nasim, after reading this I searched on “3d pop” and ended up reading your piece here: photographylife.com/the-d…ern-lenses (including the last paragraph). Putting these two items together, I’d hazard that (1) you believe that some lenses yield this “3d effect” better than others; and (2) you believe it’s not strongly correlated with any simple metric like number or type of lens elements. Is that fair? Thanks for these thought-provoking articles. Cato, please re-read that article in its entirety. This is a superb analysis and a remarkable amount of effort must have gone into its preparation. It is inavlauble for someone like myself who has been on DSLRs for decades and has yet to take the plunge into mirror less. Based on your experience, do you think Fuji will have a discount season like last year? Thank you for a very well written article. I see a lot of thought has gone into it. Thank you. I do want to ask if you’ve looked at the FT1 adapter for the Nikon 1 series? It’s a main reason why some people even look into that system. Excellent, thank you Nasim. This is an excellent guide for folks new to EVIL cameras (EVF, interchangeable lenses). I am still smitten by the X-T20 and the famous quality of the Fuji lenses, but I’m realizing that there’s no need for me to go there now since my a6000 still works great for what I use it for (my new primary camera is my D750). One day I’ll rent the Fuji and see if I’m right that the touchscreen and the AF improvements I hope for are enough to convince me to switch. Wow! I think this is one of the most detailed MILC (mirrorless interchangeable lens camera ) systems comparison articles I have ever read. Thanks, Nasim. I see a lot of positive comments about the D750 as it is a fantastic camera. I tried to like the Fujifilm xt2. Tried it, liked it, but it is no D750. It is lighter, lenses are great no doubt about it. The D810 and D750 are just so good. Shame on me for ever thinking of another system. Maybe something like the xt-20 for a light travel companion some day. I am in no hurry. I agree! I’m spoiled as well. I’ll carry the weight. A very good overall topic. Whilst I generally agree with pretty much everything just for the sake of fairness, with regards the point about firmware and Fuji are the only ones that seem to add features to their existing line up vis Firmware updates, I think you will find this is one area Olympus excels at. My OMD EM1 for instance has had 4 firmware updates, with many new features added with each generation i.e. Keystone compensation, Tethered shooting, Focus stacking, Live composite photography , Focus bracketing, silent mode, 4K time lapse etc. all of which have been added at subsequent upgrades. The EM5 MKII is also well catered in new features though firmware upgrades as well. Don’t get me wrong, Fuji firmware upgrades are also superb and certainly the latest X-T2 V2 firmware that added many new features, was an example of how companies like Fuji and Olympus listen to their user base and keep their camera relevant much longer. I’ve owned Nikon’s for over 35 years, but have sold off a lot in recent months (now just a D500 with a few lenses), with my main system being Olympus M4/3 (with the superb EM1 and EM1 MK II), and a good selection of their pro-lenses. I’ve also recently purchased a Fuji X-T2 with Grip and the 18-55 and am currently evaluating for my needs. From initial thoughts, as good as it is, it looks like my D500’s days are numbered, and I will be only shooting M4/3 and Fuji in the future. The big three (C, N & S) really need to up their game to catch up with these two forward thinking companies in my view. Sony FE: Not portable, Expensive, Better IQ. I have read through the long list of threads above and appreciate the information however the more I read, the more confused I become. I also have read countless reviews outside of this website on both individual cameras and lenses containing bias and contradiction. I do not have a fixed view on a brand or system but do need reliable, unbiased advice please. I just want to add a thought on EF-M lenses. Of course there are not many lenses around an none of the zooms is even remotely “pro” but, they are very small and light weight. If you want something like a 17-55/2.8 on an EOS M camera i would suggest to use the EF/EF-S adapter. An EF-M 17-55/2.8 would not be much smaller or lighter than the EF-S so it IMO doesn’t make sense to offer such a lense. The EF-S + adapter has the advantage that it can be used on crop-DSLRs as well. So i think it makes sense to include (crop-)lenses that can be adapted to the overall lense-score, especially for faster or longer lenses. I have bought a used EOS M10 a few month ago and only have the 22/2 and 15-45 EF-M lenses. Thats a very small but very capable gear. I also have the EF-adapter but haven’t used it often as even the not so large 17-55/2.8 dwarfs the body and is not good balanced.